By Liam McEvoy | October 12, 2010. The Lord Mayor of Dublin has called for the introduction of new begging laws “without further delay”. The current law on begging, which banned all forms of begging, was said to be unconstitutional in a 2007 High Court decision. The Criminal Justice (Public Order) Bill 2010 will make it illegal for people to beg within 10 metres (30 yards) of business premises and ATM’s. Crime in the city centre has fallen over the last year but a recent survey found that the large number of beggars in the city centre led to the idea that it is not safe. “Only when the new law comes into force can the Gardaí arrest people who are begging right outside the front door of city centre businesses and make them stop,” Breen said. “The new law will bring an end to complaints by people who are put off going into shops and going on walks because they have to pass by beggars on their way to and from doing business in the city,” he continued. He said people working in the city centre “want to work together and do everything we can to promote the city centre as a safe and pleasant place”. Other politicians have come out in favour of the bill. However, there are others who are concerned at the possibility of those caught breaking this law going to prison. Focus Ireland, a group which works to help the homeless people of Ireland, believe that the bill will not make any real difference or do any good. 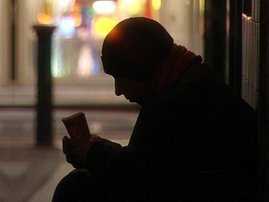 Although Focus Ireland says that the bill focuses on the problem of “aggressive begging”, they believe that it is a bad message for the government to be sending out. At a time when the state is pumping billions into the banks, more and more people are coming into financial difficulty. Focus Ireland launched its 25th anniversary advertisement campaign last month and the next stage will appear in November with radio and outdoor advertisement campaign. The Dublin Simon Community is another organisation who works with homeless people. They have seen a 20 per cent rise in the number of people sleeping rough. The Government had committed to ending long term homelessness by the end of the year with its Pathway to Home Strategy, but Sam McGuinness, the chief executive of the Dublin Simon Community, says many believe this is no longer possible. The Homeless Agency, which is in charge of the provision of services for the homeless in Dublin, last month postponed the closure of an emergency hostel in Dublin as they were unable to find long term accommodation for their homeless residents. In a statement, the Homeless Agency said its challenge is getting access to housing as opposed to Government commitment. This latest setback means it is unlikely that the Government will succeed in their plan and that the sight of homeless people sleeping and begging on the streets of Dublin will continue to be commonplace.